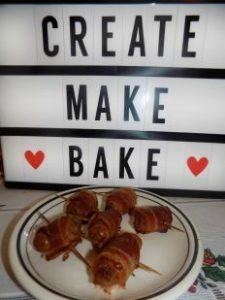 Pigs in Blankets – Create, Make & Bake! So easy you can barely call it a recipe, perfect to add to a roast or even as a nice little snack around Christmas and New Year. So incredibly easy I bet even my little sister could do it…. well maybe not. But anyway EASY PEASY. 1. Lay out the sausages on a cutting board, separate and cut in half. Do the same with the streaky bacon. 2. Neatly wrap each one and hold it together by poking a cocktail stick through the bacon and sausage. 3. Roast on a lightly greased baking tray for about 30 minutes or until bacon is crispy (don’t worry this means the sausage will be well cooked as well). Ta daaaaa! !